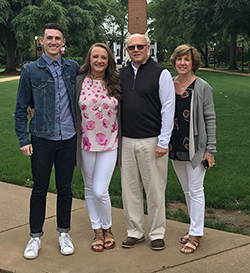 Bill and Melissa Prigge have instilled the importance of charitable giving in their children, and in recognition of its value, they contacted Department Head, Dr. Michelle Ballif to endow an academic scholarship. Their son, William, graduated with both bachelor’s and master’s degrees in English literature from the University of Georgia in 2014. As the proud recipient of the Zell Miller Scholarship, William enjoyed many academic successes in the English Department and now lives in New York City, pursuing his dream in the publishing industry. Their daughter, Jessie, also received an academic scholarship to attend college. It is the Prigge Family’s hope that their gift will, in some small way, allow other deserving students to pursue their dreams. The purpose of the Prigge Family Scholarship Endowment Fund is to provide scholarship support for students in the Department of English, who demonstrate excellence in literary studies. Scholarship recipients will be selected by a committee appointed by the Head of the Department. The criteria for the competitive selection will include demonstrated excellence in literary studies: a GPA of 3.3 or higher, two letters of support by faculty in literary studies, and a two-page statement of purpose of future career plans.